The Sudanese conflict in South Kordofan and Blue Nile, also referred to by some media as the Third Sudanese Civil War, is an ongoing armed conflict in the Sudanese southern states of South Kordofan and Blue Nile between the Army of Sudan (SAF) and Sudan People's Liberation Movement-North (SPLM-N), a northern affiliate of the Sudan People's Liberation Movement (SPLM) in South Sudan. After some years of relative calm following the 2005 deal which ended the second Sudanese civil war between the Sudanese government and SPLM rebels, fighting broke out again in the lead-up to South Sudan independence on 9 July 2011, starting in South Kordofan on 5 June and spreading to the neighboring Blue Nile state in September. SPLM-N, splitting from newly-independent SPLM, took up arms against the inclusion of the two southern states in Sudan with no popular consultation and against the lack of democratic elections. The conflict is intertwined with the War in Darfur, since in November 2011 SPLM-N established a loose alliance with Darfuri rebels, called Sudan Revolutionary Front (SRF). Military situation in Sudan on 6 June 2016. For a more detailed map of the current military situation in Sudan, see here. As of October 2014, some two million people have been affected by the conflict, with more than 500,000 having been displaced and about 250,000 of them fleeing to South Sudan and Ethiopia. In January 2015, fighting intensified as Omar al-Bashir's government tried to regain control of rebel-held territory ahead of April 2015 general elections. Although South Kordofan and Blue Nile are north of the international border separating Sudan and South Sudan, many of their residents (particularly in the Nuba Mountains) identify with the South. Many residents fought on the side of southern rebels during the long civil war. South Kordofan and Blue Nile were not allowed to participate in the January 2011 referendum to create South Sudan, and the "popular consultation" process they were promised also failed to take place. According to satellite imagery, during early Spring 2011, Sudan elevated dirt roads needed for tank transportation in the areas they are not traditionally elevated, and in March 2011 it started deploying police and military installations in the area. In May 2011, ahead of South Sudan's scheduled independence, tensions rose around the status of the Abyei Area, an oil-rich region that was statutorily part of both South Kordofan and Northern Bahr el Ghazal states. As South Kordofan was slated to remain with the North while Northern Bahr el Ghazal was seceding together with the rest of what was then Southern Sudan Autonomous Region, the status of Abyei was unclear, and both Khartoum and Juba claimed the area as their own. On 19 May 2011, militants reportedly affiliated with the Sudan People's Liberation Army attacked a convoy of mixed Sudanese Army and UNMIS vehicles 10 km north of Abyei town as they withdrew from the area's administrative centre, drawing sharp condemnation from both the Sudanese government and the United Nations. At least 15 Sudanese tanks entered Abyei town on 20 May, beginning large-scale fighting in Abyei. By 22 May, the Sudanese military had seized control of the town, and most of Abyei's residents had fled south toward Bahr el Ghazal. Both the Sudanese government and the government of Southern Sudan accused one another of violating the terms of the Comprehensive Peace Agreement. In June 2011, an African Union panel headed by former South African president Thabo Mbeki tried to de-escalate the situation through North-South talks in the Ethiopian capital Addis Ababa. On 20 June, the parties agreed to demilitarize the contested area of Abyei, and UN peacekeepers were deployed as part of United Nations Interim Security Force for Abyei on 27 June. The agreement details the mechanism by which the Abyei administration council to replace the one dissolved by president Omer Hassan al-Bashir in May 2011. Its chief shall be picked by the SPLM but must be approved by the Northern National Congress Party (NCP). The deputy however, would be nominated by the NCP and endorsed by SPLM. Three of the five heads of the departments of the administrative council would be nominated by the SPLM and the remaining two by the NCP. A police service would be established for the region, with the size and composition determined by a joint committee co-chaired by northern and southern officials. The US Secretary of State Hillary Clinton and United Nations Secretary General Ban Ki-Moon welcomed the accord but said the real test would be how both sides would implement the deal. On 21 June, a statement was attributed to the NCP's official in charge of Abyei file, Didiri Mohamed Ahmed, as saying that there was an understanding reached at the Addis Ababa meeting between the two parties that South Sudan would concede future ownership of Abyei to the North. However, the spokesman of SPLA, Philip Aguer, told the press that the statement from the NCP senior official was incorrect. On 5 June 2011, armed conflict broke out between the government of Sudan and Sudan People's Liberation Movement (northern sector) in broader South Kordofan state, ahead of the scheduled independence of the South on 9 July. The Northern army said that SPLA launched an attack on a police station and stole weapons prompting a response. The SPLA claimed that the Northern army attempted to disarm their units by force. That day JEM rebels claimed to have destroyed an army camp in the area of Jama, South Kordofan, killing 38 soldiers and wounding other 27. On 14 June, the UN accused the Sudanese government of carrying out an "intensive bombing campaign" near the north-south border which has led to "huge suffering" for civilians in South Kordofan. Some 140,000 people have fled the fighting. Aid agency offices have been looted, churches have been ransacked and buildings destroyed. Aid workers say that ethnic Nubans are being targeted by the northern military and Arab militias. This was denied by Rabbie Abdelattif Ebaid, an adviser to Sudan's information minister, who said that only rebel fighters were being targeted. On 15 June, US President Barack Obama called for a ceasefire urging both the North and South to "live up to their responsibilities" to prevent a return to civil war. The head of the worldwide Anglican church, Archbishop of Canterbury Rowan Williams said: "The humanitarian challenge is already great, and the risk of another Darfur situation, with civilian populations at the mercy of government-supported terror, is a real one". On 19 June, Sudanese president Omer Hassan al-Bashir accused the SPLM-N of "betrayal" in South Kordofan. "If they want war...we will show them practically like what happened in Abyei and South Kordofan" Bashir said. "It is better that they [SPLM-N] come to us in good terms and we will be better than them," he added. The Northern Army said that it would continue its military campaign in South Kordofan, which included aerial bombardment, until it crushes the rebellion led by former deputy governor and leading SPLM-N figure Abdelaziz al-Hilu. Fighting intensified around the state capital of Kadugli. On 6 July JEM field commander announced that his forces were able to defeat an army battalion in a field near Heglieg, comprising fifty four members, arranged a trap for the army battalion, which was composed of nine Land Cruiser cars. The head of the battalion was killed, along with two other soldiers. On 11 July, clashes were reported in Fula, South Kordofan.Sudanese Federal National Front claimed that their forces killed 20 government troops, and destroyed four of the seven Landcruisers, that carried the government troops. Their spokesman said that they also seized fire arms and ammunition. The remainder of the government troops fled. Fighting continued after South Sudan gained independence on 9 July, though the Sudanese government insisted that order had been restored in South Kordofan proper. A UN report leaked on 18 July documented alleged war crimes in South Kordofan, blaming both sides but reserving many of its heaviest accusations for the Sudanese government. The following day, UN Undersecretary-General for Humanitarian Affairs Valerie Amos called for an independent investigation into atrocities possibly committed during the conflict. Amos said the government of Sudan should lift its restrictions on access to the region. The alleged human rights abuses include "forced disappearances, targeting of UN staff and summary executions." Joint SPLM-N and JEM forces defeated government forces from 10–17 July in the Nuba Mountains. An army garrison in Al-Tais was captured by rebels. By the end, 150 government soldiers and 1 rebel were killed, considerable numbers of weaponry including light and heavy machine guns and artilleries, RBJ, AK47 and anti air craft missiles were captured by rebels. Also 3 rebels were captured. However, a JEM leader among the militants captured was later sentenced to death by hanging, state-run media reported on 27 August. Around the same time, the Sudan Tribune reported that the SPLM-N, the JEM, and the Sudan Liberation Movement (SLM) had formed a tentative alliance to resist the federal government in Khartoum. On 1 September, SPLM-N rebels in South Kordofan claimed the military was deliberately destroying crops and farms belonging to the Nuba people in an attempt to starve the state into submission. Meanwhile, state-run media claimed SPLM-N guerrillas killed 17 civilians, including children, and wounded 14 in the Kalugi region of South Kordofan the same day. On 7 September, clashes between Abdel Wahid's Sudan Liberation Army and Sudanese army were reported in Jebel Marra, rebels claimed to have killed 40 government soldiers and captured six of their vehicles. Three rebels were killed and another four were wounded. A spokesman for the Sudanese military said that SPLM-N militants attacked army positions in Ad-Damazin, the capital of Blue Nile state, late on 1 September. Governor Malik Agar disputed this account, saying the army attacked Blue Nile state institutions first, including his official residence. The military quickly took control of Ad-Damazin, and Khartoum sacked Agar and replaced him with a military governor. Agar and his allies regrouped in southern Blue Nile. On 2 September, the federal government declared a state of emergency in the state. The Sudanese Air Force reportedly carried out strike missions, bombing SPLM-N villages and towns. The SPLM-N claimed four civilians were killed in an aerial bombing of Kormok. By 22 September, the SPLM-N claimed victory in several battlefields (in the areas of Ibri, locality of Dlami; Angrto, locality of Talodi and Abolhassan, in the locality of Cdarno) killing 25 soldiers and militias belonging to the Sudanese Armed Forces (SAF) and captured several soldiers and weapons. Some degree of notoriety was accorded to the SPLM-N's use of Rick Derringer's "Rock 'n' Roll Hoochie Koo" as something of a battle anthem during the 2011 violence. The SPLM-N's Darfuri allies, the JEM and the SLM, issued a joint statement on 4 September condemning the Sudanese military's use of force against the SPLM-N in Blue Nile, calling it a plot to spread "chaos and killing" across the country. They also called on the United Nations Security Council to impose a no-fly zone over Blue Nile, Darfur, and South Kordofan. Helicopters, Antonov An-26s, MiG-29s and other aircraft at El Obeid Airbase where the SAF are believed to be attacking from. The Sudanese military claimed on 10 September to have broken an SPLM-N "siege" of Qiessan, near the Ethiopian border, and evacuated its wounded from the town, though it was unclear whether they took control of Qiessan outright or just escaped from the area. Both Agar and Yahia Mohamed Kheir, the military governor appointed by Bashir, claimed control of 80 percent of Blue Nile state. Meanwhile, the Sudanese government said 5,000 people had fled their homes in Blue Nile as a result of the fighting, and Information Minister Sana Hamad al-Awad claimed it had proof the South Sudanese government was paying the salaries of SPLM-N fighters across the border. By 3 October, SPLM-N forces clashed with Sudanese army in South Kordofan killing 47 army members, including three well-known militia leaders and cinjuring 23 more. On 9 October, SPLM-N rebels ambushed government soldiers in Khor Adrak in Blue Nile, killing 30 of them and destroying three army vehicles and capturing another one. The Sudanese military seized control of Kurmuk, the former stronghold of the SPLM-N in Blue Nile state, on 2 November. President Omar al-Bashir visited the town four days later to declare it "liberated". He also threatened South Sudan with war, accusing it of supporting the SPLM-N in its anti-government activities. SPLM-N control in South Kordofan in October 2011. On 10 November, it was reported that the Sudanese government bombed Yida camp in South Sudan's Unity state soon after 12:00 GMT the same day. Two Antonov makeshift bombers were seen leaving the area. They were said to have dropped five bombs, four detonating. The local official Miabek Lang said at least 12 people had been killed and 20 wounded during the strike. The Sudanese government has denied the claims. Darfuri factions and the SPLM-N in Blue Nile and South Kordofan states announced the formation of an alliance called the Sudanese Revolutionary Front on 12 November. The stated goal of the coalition is to overthrow the Bashir government and install a democratic system in Sudan. On 23 November, SLA-AW forces clashed with SAF forces in North Darfur's Kabkabiya region and taking over 10 Land Cruisers loaded with guns in addition to capturing three soldiers, one of the rank of a sergeant. 35 army soldiers were killed in the clashes. Rebels claimed the victory on the battlefield. The Sudanese Armed forces said they managed on 5 of December to defeat the rebels of the SPLA in South Kordofan's region of Lake Alubaid, where the armed forces seized the head of division nine in all its three camps.The Sudan People's Liberation Movement however strongly denied this happening, and asserted in return that it had destroyed a whole unit of militias affiliated to the National Congress Party and its armed forces near the city Toroj, killing 60 of the Sudanese army and militia and destroying 3 armored vehicles.They also stated that they took over armored vehicles and artillery guns with a number of ammunition and fuel. On 9 December, SAF and SPLM-N rebels claimed victory (both) in South Kordofan battle. Rebels claimed to have killed 40 Abu Tira soldiers (pro-government), including the head of the team. They also said that three Land Cruiser cars loaded with guns were destroyed; three artilleries and tens of light weapons, including RBG 7 and BKM machine guns were taken over. They also claimed to have dispersed militias of the National Congress Party (NCP) under the head of Kafi Tayar who attacked Dalkoma, ten kilometers south of Kadugli, resulting in the death of nine. SPLM-N fighters in South Kordofan reported turning back Sudanese army elements attempting to dislodge them from positions in Warni on 10 December, as well as the capture of the localities of Abu al-Hassan and al-Rashad three days earlier. The battles left 19 dead, a spokesman for the rebel group claimed. By 12 December, fighting had shifted to Taruje, near the international border with South Sudan. In a related skirmish, South Sudanese and Sudanese regular divisions clashed at Jau, a disputed town on the border, in what a Sudanese army spokesman described as a victory for Khartoum's soldiers. On 21 and 22 December, students began protesting at the University of Khartoum and the Red Sea University in a flare-up of anti-government protests that began in January. A number of Darfuri students at the Red Sea University threatened to leave in protest after several student leaders were arrested late on 21 December, and by 25 December, they had declared their allegiance to the Sudan Revolutionary Front and were calling for the overthrow of the Sudanese government. Several students at the University of Khartoum, including at least one Darfuri student association head, were taken into custody by security troops on 22 December after a multiethnic protest against the Merowe Dam in solidarity with the Manasir facing displacement as a result of its construction. The students in Khartoum also began agitating for the government's ouster on 24 December, following the clashes and arrests on campus two days earlier. On 25 December, Justice and Equality Movement leader Khalil Ibrahim was intercepted and killed along with 30 of his fighters in North Kordofan, west of Wad Banda. Sudanese state media reported Ibrahim was defeated in fighting with the army. JEM confirmed Ibrahim's death, but said he had been killed by an airstrike, not in combat with Sudanese ground troops. Ibrahim's death came one day after JEM fighters struck three villages in the state. By early January, reports of malnutrition and hunger increased in the conflict-afflicted zones. According to the United Nations, close to 417,000 people had been displaced, including 80,000 who fled to South Sudan. By 20 January, heavy clashes broke out in Blue Nile state between SAF and SPLM-N. Rebels claimed to have destroyed an army helicopter that was trying to rescue some troops. In the clashes 26 soldiers and 7 rebels were killed. Also 6 rebels were wounded. In the 1 February, clashes between Justice and Equality Movement soldiers and a group of armed Arab citizens in East Darfur left 3 rebels killed, the attacks occurred as a response to repeated violations by JEM in the area. On 22 February, SLM-MM forces killed 12 government soldiers and took control of the Alawna area, in Dar El Salaam locality, south of El Fasher, in North Darfur.The SLM-MM also said they destroyed one vehicle and stole another belonging to government forces and said one of their soldiers was wounded in the fighting. On 26 February, rebels from the recently formed Sudan Revolutionary Front claimed to have killed up to 130 Sudanese soldiers in an attack on a Sudanese army garrison around Lake Obyad, near the border with South Sudan. South Sudan accused the north of bombing two Southern oil wells using its air force on 1 March, destroying both structures, allegations the north denied. The incident raised fears that war could break out between the two countries. During this, in the 6 of this month, JEM rebels and Sudanese army clashed in North Darfur. The JEM claimed to beat and killed soldiers, and destroyed vehicles and weapons belonging to government troops. On 26 March, the Sudanese air force bombed areas of Unity state in South Sudan, and sent army and militia forces across the border. South Sudanese forces counter-attacked and seized control of the Heglig oil fields as South Sudan's President Salva Kiir warned of war. On March 30, more fighting was reported in the border area between the Sudanese Army and rebels. On 1 April, the SRF claimed to have the control of Heglig, were they killed hundreds of government soldiers, forced others to flee and seized many of their weapons and armoured vehicles. Also SLM-AW claimed to have beaten government soldiers in Darfur, were they destroyed eight vehicles and seized one loaded with weapons. On 12 and 13 April, the rebels claimed to had killed 79 government troops and captured another nine in two ambushes in the mountainous terrain, about 35 kilometres south of the Blue Nile state capital of Ed Damazin. For their part they stated three of their fighters were killed and seven wounded in the fighting. The government had no comment on the claim. The previous week the rebels also stated that they killed 13 soldiers for the loss of one rebel in an ambush 20 kilometres (12 miles) south of Ed Damazin. The government denied those losses. On 15 April, government troops took control of Mugum, a stronghold of the pro-southern rebels, in the Blue Nile state, near South Sudan's border. The government news service claimed, per an "informed" military source, that 25 rebels were killed. On the 9 of May, SRF withdrew from Gereida after taken the control of the city some days before, were SLM-AW claimed to have killed 17 soldiers, destroyed a tank and six trucks along with the army's weapon stores. On 3 July, fighting between the Sudanese Armed Forces and an Arab rebel movement broke out in West Darfur, rebels destroyed 10 government cars and captured 25 soldiers, also 6 rebels were killed, 4 injured and 2 captured. On 6 July, a state official of Sudan was killed among 7 others in an attack on a government convoy. Ibrahim Balandiya, South Kordofan's parliament speaker, was attacked between two villages in the region. He is the most senior official to be killed during the whole conflict, according to state news agencies. Sudan blamed SPLM-N for the attack which also killed another state official. The other official was Faisal Bashir, the head of South Kordofan's strategic planning committee, according to SUNA. On 23 July, Sudan Revolutionary Front (SRF) clashed with government forces and militia in Kirkdy, South Kordofan and in Alhtbaun, North Kordofan. Rebels say that they killed or wounded dozens of government troops since the clashes started and they took control of two tanks and 20 vehicles. On 25 July, clashes between SPLM-N and SAF resulted with 46 army soldiers killed, 32 wounded and 5 rebels killed. Rebels won the battle and took control of the area, Al Sanot County in South Kordofan. On 29 July, rebels announced the destruction of a camp belonging to the Armed Forces in El-Meiram area, South Kordofan.The SRF killed seven and injured three others of the government troops, including the camp commander, ranked captain. Also, they seized one vehicle and destroyed another. In addition, they seized large quantities of weapons and ammunition. Also 1 rebels was killed and another was injured. On 3 June, SRF forces claimed to have defeated government in Fataha in Al Lait Jar al Naby locality in North Darfur,capturing 18 of their vehicles. Sudanese authorities claimed to killed 40 rebels, destroying many trucks and losing some soldiers, but this was deniyed by the rebels. On 7 June,seven government troops were killed and six missing in Tabaldi in East Darfur after clashes with the Sudan Revolutionary Front. On 26 June, SRF forces attacked a government convoy in the village of Dugu Al Umda, close to Al Malam in South Darfur, killing up to 100 soldiers, capturing 60 vehicles and destroying 5. Also 3 rebels were injured. By 1 August, SPLM-N accused the government forces of killed, wounded and abducted dozens of people in South Kordofan. A number of villages in the El-Abbasiya Tagaley county, South Kordofan, were burned. Rebels who were protecting these villages clashed with government forces, killing 17 of them and wounding 27 others. An army vehicle traveling in the western part of South Kordofan was ambushed on the 21 of August, the Sudan Revolutionary Front has announced. The ambush on the road between Muglad and Babanusa left dead 11 army troops. The attack was carried by SLM-MM troops. On 22 August, clashes between SPLA-North and SAF were reported in the villages of El-Houta and El-Daein, in Rashad Locality South Kordofan. Sudanese Revolutionary Front allegedly killed 17 and injured another 24 soldiers of the Sudanese Armed Forces (SAF) and pro-government militias also two Land Cruiser vehicles and a truck were destroyed during a battle. 1 SRF soldier was killed and another2 were injured during the battle. In the 25 of August, Sudanese army claimed to have killed 17 rebels and wounding dozens in South Kordofan, and they retaken the control of Al Murib.Their spokesman added that 1 of his soldiers was killed and another nine were injured.On the other hand, SRF announced killing 61 SAF and pro-government militias' soldiers, and injuring dozens.Rebel troops also seized large quantities of weapons and ammunition. They also onfirmed the loss of five SPLA-N soldiers and injuring seven other soldiers. On 6 September, the Sudanese army claimed to have killed 77 rebels . 45 of them were killed in Hajar Al-Doum, South Kordofan and the 32 others were killed in Al-Aradeep Al-Ashara, North Darfur, also they claimed to have destroyed 10 of the rebel armed vehicles. Heavy clashes were reported since the 7 of September in several areas. In El-Aradib El-Ashara area, which is under SRF control, government forces were able to evacuate 85 bodies and 25 injured soldiers in large trucks. SRF confirmed they were in control of El-Aradib El-Ashara area as well as defeating government forces in Khazzan Tunjur area. Adam Saleh, official spokesperson of SLM-Minnawi, denied the Sudanese army's claim that 32 SRF soldiers were killed and ten of their cars were destroyed in East Jebel Marra. SRF in South Kordofan announced on September 8 that they managed to defeat government troops in the 'Kilo 50' area, between El-Dibab and El-Muglad. Clashes were also reported in the Nuba Mountains, where SRF (belonging to SPLM-N) announced defeating government troops and militias attempting to occupy the villages of Dloka and Daldako South and northeast of Kadugli city, also SLA troops killed 9 government soldiers and injuring 25 other government soldiers. On 20 September, heavy clashes between SLA-MM and SAF occurred in Kolghe, East Jebel Marra, North Darfur, where 80 government soldiers and 1 rebel were killed. Rebels also got 1 injured, but their forces seized 12 Land Cruisers loaded with different weapons and mortars, 12 rifles, 14 Dushkas and one vehicle holding two long-range Hauser missiles. Sudanese Air Forces destroyed two army vehicles carrying heavy weapons, which the SRF was trying to seize. On 25 September, SLM-MM forces killed dozens of government soldiers and pro-government militias and destroying 5 of their vehicles during the clashes, which took place in Hashaba area. Clashes took place between Tabit and Shangil Tobai, East Jebel Marra, North Darfur, on 27 September where joint troops of SLM-Minnawi, Justice and Equality Movement (JEM) and SLM-Abdel Wahid fought together and killed and injured dozens, they also completely destroyed 180 vehicles belonging to the SAF and to pro-government militias. Rebels captured these area. According to the SAF, 70 rebels were killed and only 12 army soldiers were slain. On its turn, the SRF announced that as a result of last Thursday's battle, 84 government troops were killed and several got injured.In addition, they claimed to have seized 23 small vehicles carrying light and heavy munition, three trucks, fuel and four trucks loaded with munition and other supplies. Mustafa Tambor, spokesman of SLM-Abdul Wahid, announced the killing of 22 Sudanese government troops on Monday, 1 October. He said they attacked a government convoy traveling from Ribeige locality in North Kordofan to Al-Aiyd Jaranebi locality, in North Darfur. They also seized 16 of the vehicles and burned another nine. By 14 October, SRF killed 21 army soldiers and 7 pro-government militias in a battle against government forces in South Kordofan, on October 14. Government forces claimed to have captured 1 rebel. By the same day, rebels announced that their troops managed to clear the area of Surkum, Blue Nile, and that the government troops suffered heavy losses during the battles. SRF troops seized two tanks and two Land Cruiser vehicles from the government. Also SRF troops killed seven government troops' elements in the battle, including a lieutenant in South Kordofan. Government claimed to have killed 12 rebels, injured another dozen and captured one who were attacking the village of Umm Dehelib, in Kalogi locality. By the 15th of this month, JEM and SAF forces clashed in the area of Umm Zeifah, South Kordofan, where dozens of government forces were killed, including the force commander. The rebels destroyed three army vehicles and seized two another two that were carrying large quantities ammunition and weapons. On 18 October, clashes were reported in the area of Abu Delek southeast of El-Fasher. 63 government troops were killed and dozens injured during the battle, SRF troops seized 19 Land Cruiser vehicles and destroyed eight other vehicles, as well as seizing several light and heavy machine guns and ammunition. 1 SRF soldier was killed and 3 others were injured. After the battle SRF troops were in full control of the area of Abu Delek. The Sudan People's Liberation Army-North (SPLA-N) announced killing 6 Sudanese military troops in South Kordofan on 22 October, a Sudanese soldier was also captured and rebels also seized weapons and ammunition from the army vehicles. The Sudan People Liberation Movement-North (SPLM-N) announced it killed 30 Sudanese government troops and injured another 25, in East El-Leri, South Kordofan on 31 October when the rebel group attacked and destroyed a camp of government troops and seized their guns and weapons. 1 SPLM-N soldier was killed during the battle and that another 4 got lightly wounded. The Sudan People Liberation Movement-North (SPLM-N) announced to have killed 70 Sudanese government troops and wounded another 150 on 2 November. In addition, six SPLM-N soldiers were killed and 16 got injured. The clashes occurred in Del Da'ako northeast of Kadugli, South Kordofan. By 7 November, SPLM-N forces claimed to have shot down an Antonov airplane after it carried out air bombings in South Kordofan. On the same day, SPLM-N ambushed and killed 10 Sudanese soldiers between Hajar-jawad and Angarko villages, on the Kadugli-Dilling highway. Clashes between troops of the Sudan Revolutionary Front (SRF) and the Sudanese army on November 9 in Wadi Murrah, near Tabet in North Darfur, reportedly killed and injured more than 100 elements of the Sudanese army.SLM-MM also captured 7 soldiers and six vehicles loaded with Katyusha rockets, three vehicles with anti-aircraft missiles and five loaded with food and medicine.4 rebels were killed and another 10 were injured. The Sudan Revolutionary Front (SRF) reportedly destroyed a Sudanese army camp in Alhigairat, located west of the Kadugli airport, killing 23 soldiers from the Sudan Armed Forces (SAF) on 14 November. Many other Sudanese soldiers got injured and another 11 were captured during the attack, 1 rebel was killed and another 11 got slightly injured. Rebels found six women and two children in the army camp, who were 'taken to safer area'. The SRF also seized one 12.7mm machine gun, one mortar 82mm, four mortars 60mm, four R.P.G-7s, four P.K.M machine guns and a large quantity of various ammunition and shells. The Sudan Liberation Movement led by Abdelwahid (SLM-AW) announced killing 83 Sudanese soldiers in the area of Ed el-Nabq, in Kabkabiya locality, North Darfur on 23 November.Other 4 soldier were wounded. Rebels also seized 'heavy and light weapons, various types of ammunition and five Land Cruiser vehicles'. SPLA-N forces ambushed Sudan Armed Forces (SAF) patrolling troops on the road between Kaluba village and Alfaid village, west of Rhada city on November 24. 6 members of the SAF were killed. On 5 December, Sudanese army claimed victory over LJM rebels in the western gate of El-Fasher, killing 2 of them, capturing 3 rebels and 3 vehicles. On 10 December 2012, the Sudanese army, reinforced by a few paramilitaries of the Popular Defense Forces, attacked the Sudan People Liberation Movement-North (SPLM-N) in Daldoko, northeast of Kadugli, South Kordofan. The attack was made from two direction : a diversionary direct attack and a main flank maneuver. This latter forces was ambushed and repelled. According to the rebels, after a first T-55 tank was destroyed, the government soldiers fled, abandoning 4 other tanks. On next day, the movement announced 27 government soldiers had been killed and 3 captured while 3 rebels had been killed and 11 wounded in the clashes. The rebel movement claimed to have seized seven tanks from the army, five of which in good condition, while the other two were destroyed. Besides, two "big cars" were reportedly confiscated, and three mounted Land Cruisers, one was in good condition and the other two were destroyed. The capture of 4 T-55 and 1 BRDM-2 has been confirmed by an independent report. On 12 December, the Sudanese army lost at least another BRDM-2 and one BTR-80A in another combat. The SPLM-N claimed on 16 December that government forces attacked several localities in the Nuba Mountains. The rebels claimed to have killed 12 Sudanese soldiers and wounding another 16, also 3 rebels were injured in the clashes. On 15 December, 8 Sudanese soldiers were killed and another 4 injured after a fighting in a dispute between them in the garrison of Mornei, located on the north side of the city. On 16 December, a wrongly Sudanese Air Force airstrike killed 27 of its own soldiers and left four army vehicles destroyed and dozens of soldiers injured in the area of Bir Jaber in East Jebel Marra. By 17 December, SLM-AW rebels attacked an army convoy in an area west of Kabkabiya, North Darfur, killing 18 of them. On a different event, the Justice and Equality Movement (JEM) claims to have captured the army Lieutenant Tahir Ahmed Ibrahim, from White Nile, and seized three vehicles mounted with heavy artillery and three dushkas, along with a large amount of fuel. On 18 December SLM-AW killed more than 20 Sudanese soldiers in an attack on an army base in Jebel Moon, locality of Seleia in West Darfur, also seized six military vehicles loaded with arms and ammunition. 2 rebels were killed in the attack. A fierce battle between the Sudan Armed Forces (SAF) and the Sudan Revolutionary Forces (SRF) of Abdel Wahid left tens of combatants killed in West Jebel Marra area, Central Darfur,the battle on 23 December and finished the next day. According to the SRF the government lost over 90 people, while the rebels reported at least 7 fatal casualties and 10 wounded combatants. the SRF claimed to had captured the major SAF base in the central town of Golo, leaving the government with only two strongholds in Jebel Marra. The rebels, of SLM-AW faction, destroyed the entire base and captured 15 pick up trucks and weapons. On 28 of December, SLM-AW rebels captured two key garrison towns of the Sudan Armed Forces in Darfur, where 47 government soldiers and 2 rebels were killed. Also 4 rebels were injured. On 7 January, heavy fighting between SAF and SLM-AW rebels in West Jebel Marra, Central Darfur left 70 soldiers and 5 rebels dead, other 7 rebels were injured. Rebels also destroyed 25 government Land Cruisers and seized another 11 vehicles loaded with weapons. Rebels claimed to be currently in full control of the Jildu garrison. But on 9 January, Sudanese army claimed to have the control of Jildu after killing 30 of the rebels. On 13 January, Sudanese army claimed to have clashed with SPLM-N rebels in the areas of El-Homra and El-Ehemer, South Kordofan, killing 50 of them, destroying 4 of their tanks and losing several soldiers. This was deniyed by the rebels, who claimed that 43 government troops were killed, hundreds were injured and two army tanks and two Land Cruisers were destroyed in the battles. They added the SAF killed 8 rebels, injured 21 and destroyed 2 of their tanks. By the same day SLJM rebels claimed to have killed more than 25 government troops and its militias in a combat in South Darfur. Also 3 rebels were killed the rebels had two of their vehicles destroyed but managed to seize several heavily armed Land Cruisers and ammunition belonging to the military. One army garrison was destroyed. On 19 January, Sudanese government forces attacked the SPLM-N in the village of Al-Shifir, South Kordofan, where 4 government soldiers and 2 rebels were killed, also 4 were injured. In the 6 of February, a battle near Golo, Central Darfur, left 52 Sudanese soldiers and 5 SLM-AW rebels killed. Rebels also captured 13 soldiers, seized 21 Land Cruisers and damaged three vehicles belonging to the army. In the next day, SLM-AW rebels seized a military bade near Golo, killing 123 Sudanese soldiers and capturing nine Land Cruisers mounted with Dushkas and three long-range missiles belonging to the army. Also rebels had 3 killed and others wounded. On 12 February, SLM-AW rebels clashed with SAF in the area of Carmel, east of Golo, where the rebels defeated the army, killing 39 Sudanese soldiers. They also captured two Land Cruisers loaded with weapons and destroyed five others, all of which belonged to the government. On 14 February, SLM-MM and JEM rebels battle with government forces in the area of Umm Gunja in Bilel locality, near Nyala in South Darfur, killing 87 soldiers, capturing another 9 and capturing 11 of their vehicles. On 20 February, the Sudanese army claimed to liberate the area of Mapho in South Kordofan, killing 66 SPLM-N rebels and wounding another 70, destroying a tank, four Land Cruiser vehicles and two tractors, and suffering several casualties. This information was deniyed by the rebels. The next day, SPLM-N forces expelled government forces from the area of Mapho in Blue Nile state. Sudanese army admitted the rebel victory, and to have suffered big losses in the battle. On 25 February, SLM-Juba Unity rebels claimed to have killed 17 Sudanese soldiers in clashes on the area of Al Aradeeb Al Ashara, East Jebel Marra in North Darfur. The movement claimed destroying 9 cars and seizing 4 Land Cruiser vehicles mounted with Dushka's machine guns. In addition, the movement's leader stated five Sudanese soldiers were captured. Abdel Shafi said that 2 of the movement's men were killed during the battle and 3 men were injured. On 4 March, Sudanese army claimed victory onm JEM rebels in the Wad Bahr village in Wad Banda locality in North Kordofan after the rebels entered in the country from South Sudan, killing many of them. Rebels deniyed this, but they claimed to fight with SAF forces in the same area killing 100 soldiers and seizing 25 Land Cruisers, two Ural trucks, two commander tanks and score of weapons. A joint rebel offensive (JEM and SLM-MM) in the road connecting Tawila and El Fasher in the area of Kuim, North Darfur, killed 25 Sudanese soldiers, captured many soldiers and 2 armed vehicles and destroyed more. The rebel groups Sudan Liberation Movement for Justice (SLMJ of Karbino) and Sudan Liberation Movement- Unity (SLM-Unity of Abdullah Yahiya) claimed an attack on Abu Tira convoy in north of El Fasher in North Darfur, killing 7 of them and capturing 1 vehicle. 2 rebels were killed and another was injured. On 12 March, SPLM-N rebels and SAF forces clashed in the Blue Nile State. In the battle SAF claimed to have killed 40 rebels, destroyed a tank and two vehicles belonging to the rebels and confiscated quantities of heavy weapons and ammunition. Rebels claimed to have killed 16 soldiers, wounded another 26 and destroyed 7 of their vehicles. On 15 March, heavy clashes between SLM-MM rebels and government forces left hundreds of people killed. Rebels killed 260 government soldiers; 170 soldiers and 90 militias; captured 36 officers and seized 23 vehicles. According to rebels, 3 of their soldier were killed and 6 were injured. Rebels gained the control of Abga Radji Biaman area. According to the Sudanese government 100 rebels were killed or injured in the battles and 14 of their vehicles were destroyed. On 6 April, clashes between SLM-MM and government forces in South Darfur left dozens killed on both sides. In the 7 of April, SLM-MM rebels seized Muhajeriya in East Darfur, killing up to 70 Sudanese soldiers and destroying 2 armed Land Cruisers. On 8 April, clashes between SLM-MM seized the village of Ishma at about 8 kilometers from Nyala in South Darfur, where 100 government soldiers and several rebels were killed. SAF forces also lost 4 heavily armed vehicles. In the same day, the rebel groups SLMJ and SLA-AW killed 18 Sudanese soldiers when they seized the Dobbo garrison in North Darfur. The rebel forces seized food, weapons and five Land Cruisers belonging to the SAF besides destroying a Renault truck and a Land Cruiser vehicle. On 14 April, SLM-MM rebels seized a military base in South Darfur located in a strategic region. 40 Sudanese soldiers were killed during the takeover.SLA-MM also seized two vehicles and a large number of weapons belonging to the Sudanese army. On the 16 April, 15 Sudanese soldiers and 4 SPLM-N rebels were killed when the rebels captured the Dandor garrison near Kadulgi, rebels also captured three trucks, three Korean-made jeeps mounted with Dushkas MG, in addition to mortars and several different types of ammunition. On 18 April, SLM-AW rebels captured two garrisons near Nyala in South Darfur, killing 17 Sudanese soldiers, captured many weapons and ammunition, and 10 Land Cruisers mounted with heavy artillery. On 22 April, SLM-MM rebels attacked the Nyala airport, and defeated government forces in Morla, killing 100 of them, capturing 10 vehicles and destroying another 13 and 1 tank. But Sudanese army claimed to be in control of Morla, where they claimed to killed dozens of rebels. Rebels deniyed this and claimed that only 5 of their fighters were killed. On 8 May, rebel forces claimed to have killed 60 government soldier who were trying to racapture the city of Abu Karshola, South Kordofan. Also 9 soldier were captured and a MIG aircraft was shooting down. By 14 May, rebels killed 411 Sudanese soldiers who were trying again to recapture Abu Karshola, SRF forces destroyed 37 military vehicles. They also captured a tracked armoured vehicle and five large trucks, as well as 26 Land Cruisers loaded with weapons, ammunition, machine guns and other equipment. Also 44 soldiers were captured. But some days later, rebels made a tactical withdrawal from the city. On 27 May, SPLM-N rebels and SAF forces both claimed victory over the Dandor garrison east of Kadugli, capital of South Kordofan. Rebels killed many Sudanese soldiers and destroyed a tank and two Land Cruiser vehicles loaded with weapons, for the loss of five SRF men killed in the battle. The Sudanese government claimed to have killed 70 rebels in the fighting. On 31 May, rebels attacked again Abu Karshola, downing a chopper (the 6 soldiers inside were killed) and killing 30 and capturing 3 Sudanese soldiers.The SRF also captured a Land Cruiser with ten 120mm mortars and destroyed another five similar vehicles loaded with weapons. On 4 June SLM-MM killed 46 Sudanese soldiers in a battle in the Tor Taan region in South Darfur. Rebels also captured 24 vehicles in good condition and various types of ammunition and rocket launchers. This is in addition to the 80 fuel tankers the SLA-MM claim to have captured in the previous days. On 9 June, a new rebel attack on Abu Karshola killed 14 Sudanese soldiers and captured another 5. On 10 June, SLM-AW rebels clashed with SAF forces in south of the Thur area, Central Darfur, killing 29 soldiers, seizing seven fuel tankers with a capacity of 250 barrels and destroying one military truck and two Land Cruisers. On 11 June, SPLM-N troops started attacking near and inside the South Kordofan capital, Kadugli, making heavy casualties to the government forces. In the 14 of June 9 SAF soldiers were killed and a MIG aircraft was destroyed. On 19 June, SPLM-N rebels killed 5 Sudanese soldiers and injured another 8 in the upper Nile. By 26 June, SLM-MM rebels killed 7 Sudanese soldiers in a battle in North Darfur. They also captured 4 armed vehicles. 2 July - Forces of the Justice and Equality Movement (JEM) reportedly clashed with Sudan Armed Forces (SAF) contingents on Tuesday, 53 kilometres from the town of Dilling In South Kordofan. 4 July - The spokesman for the Sudan People's Liberation Army-North (SPLA-N) claims his forces have "defeated and captured" Ambir army base in Rashad locality, South Kordofan on Thursday. Arnu Ngutulu Lodi told Radio Dabanga that 24 members of the Sudan Armed Forces (SAF) were killed in the battle, and "several were wounded". The SPLA-N claims to have lost two men and 13 have minor injuries. 9 July - The Sudan People's Liberation Army-North (SPLA-N) claims to have destroyed two separate Sudan Armed Forces (SAF) patrols in the Nuba Mountains area of South Kordofan, killing 26 government troops, for the loss of "one dead and three slightly wounded". 16 July - The Sudan Revolutionary Front (SRF) claims to have killed seven government troops and captured two officers in a clash in Rashad locality in South Kordofan on Monday. 28 July - Reports of ongoing clashes in South Kordofan between formations of the Sudan Armed Forces (SAF) and contingents of the Sudan Revolutionary Front (SRF), apparently spearheaded by the Justice and Equality Movement (JEM), have continued to reach Radio Dabanga all weekend. JEM deputy head, Mohamed Al Beel Issa Zayyed, claimed that the SRF has "killed more than 52 regular troops and pro-government militiamen, including leading figures Amir Al Mujehedin Aburahman Abu Fursha as well as Rahman Jigir. 19 August - The Sudan Revolutionary Front (SRF) claim to have killed 15 "Sudanese army and government militiamen" on Monday, after attacking a military convoy near to Kass in South Darfur. 25 August - The Sudan Revolutionary Front (SRF) claim to have killed 22 pro-government militiamen, injured others, and destroyed their camps in the Dukan and Al Humbo areas of Geissan locality in Sudan's Blue Nile state. 31 August 2013, an SPLM-N spokesman announced a one-month unilateral cessation of hostilities due to the widespread floods in the region. 1 September - Sudanese rebel forces claim to have killed 10 and injured more than 30 troops of the Sudan Armed Forces (SAF) and pro-government militias in action on Saturday in Bau locality, Blue Nile state. 13 October - The Sudanese Liberation Movement for Justice (LMJ-Karbino) claim to have killed 19 members of the Sudanese Armed Forces and pro-government militias, injured others, and captured two, in the area of Um Sa'ouna, north of Ed Daein, capital of East Darfur. 22 October - Defectors from the Tijani Sese-led Liberation and Justice Movement (LJM), claim to have killed ten government troops during a battle with the Sudanese Armed Forces (SAF) in the area of Amarjadeed, East Jebel Marra. 27 October - The Sudanese Armed Forces (SAF) and Sudan Liberation Army led by Abdel Wahid (SLA-AW) have reportedly clashed in Mellit in North Darfur. A total of 18 people from both sides were killed, the rebels spokesman claims. In a statement issued on Saturday, the spokesperson for the SLM-AW, Abdelrahim Nimr, reported that the movement took control of Mellit town on Friday. According to Nimr, 16 militiamen were killed and a number of vehicles loaded with weapons and ammunition seized. Two of the movement's troops were killed. 28 October - The Liberation and Justice Movement, led by Ali Karbino (LJM-K), announced that they captured three Sudanese Armed Forces (SAF) troops during the clashes in Amarjadeed, north of Manawashi in South Darfur. 31 October - Troops of the Sudan Revolutionary Front (SRF) attacked the headquarters of the Central Reserve Forces (also known as Abu Tira) in the locality of Mershing, South Darfur. Witnesses say that three Abu Tira troops were killed and four others injured, including a civilian. The SRF said it lost one troop and three others were injured, while it "killed 37 government troops and militiamen". 3 November - The Sudan Revolutionary Front (SRF) announced that their troops launched an attack on a Sudanese Armed Forces battalion in the area of Nimra, East Jebel Marra, combined force of LJM-K troops and forces of Minni Minawi's Sudan Liberation Army (SLA-MM) and the Sudan Liberation Army-Abdel Wahid (SLM-AW) attacked a battalion consisting of 75 vehicles and four tanks, dozens of Sudanese Armed Forces (SAF) troops and government militias were killed and 10 SAF vehicles destroyed. 12 November - The Sudan Revolutionary Front (SRF) claims to have launched an attack on a battalion of Sudanese Armed Forces (SAF) and militias in the area of Deleima in South Kordofan. According to Zayed, the joint rebel forces killed more than 60 SAF and militia troops, including the battalion commander. 17 November - The Sudan Revolutionary Front (SRF - an alliance of Darfur, South Kordofan and Blue Nile rebel groups) announced that its troops entered the town of Abu Zabad, 150 km southwest of El Obeid, the capital of North Kordofan. 17 November 2013, JEM guerrillas launched an attack on the town of Abu Zabad, the attack was repulsed.JEM's second deputy general commander Mohamed Rahouma was killed in the skirmish. On 20 November 2013, Sudanese troops recaptured the Kaling area of South Kordofan from SRF rebels, who relocated to the Rashad district. 21 November - The Sudan People's Liberation Movement-North (SPLM-N) forces of the rebel alliance Sudan Revolutionary Front (SRF) have allegedly regained control of Kalinji village in the Nuba Mountains, South Kordofan. 1 December - The Sudan Revolutionary Front claims to have killed more than 100 Sudanese army and militia troops in an attack on three military convoys south of Abu Zabad, near the border between North and South Kordofan. 3 December - Forces of the Sudan People's Liberation Movement-North (SPLM-N) claim to have destroyed a Sudanese army camp in Fayu, west of Dalami in the Nuba Mountains, South Kordofan state, causing heavy casualties to the Sudanese army. 10 December - The Sudan Armed Forces (SAF) and the Sudanese People's Liberation Movement-North (SPLM-N) have clashed in Blue Nile State, southwest of Damazin, the capital of the state. The rebels reported at least one casualty from their side, while they claim that the army lost at least ten soldiers. 13 December - The Sudan Revolutionary Front (SRF) attacked the Sudanese army at about 6 am on Friday morning in the area of Abata, 20 km north-east of Zalingei, the capital of Central Darfur. At least 19 soldiers were either killed or injured, according to an eyewitness. 17 December - The Sudan Revolutionary Front (SRF) shelled military targets inside Kadugli on Wednesday, according to the spokesperson for the Sudan People's Liberation Movement-North (SPLM-N). 20 December - Forces of the Sudan Liberation Movement led by Abdel Wahid announced the destruction of the Duma military base north of the city of Nyala, in South Darfur's Mershing locality, Sudan Revolutionary Front, killed 27 government troops and captured six vehicles loaded with guns. 24 December - Darfur armed rebel movements announced the killing of 18 Sudan Armed Forces (SAF) and militia troops on Tuesday in an attack on the Katila garrison in South Darfur. 27 December - The Sudan People's Liberation Army-North (SPLA-N) in Blue Nile state claims to have destroyed patrolling forces of the Sudanese army in Bowrgo area, 30 km south of Damazin, force commander Maaz Ahmed Bagir Najib of the 4th Division in Damazin was killed. 30 December - The Sudan Liberation Movement, led by Abdel Wahid El Nur (SLM-AW), announced that its forces attacked the Disa military garrison in North Darfur, killing 23 army and militia troops, and seized three army vehicles loaded with a variety of arms. Three SLM troops were killed and two others wounded. 5 January - Sudan Revolutionary Front (SRF) forces reportedly attacked a Sudanese army battalion in Wadi Eweiji, north of Kutum, North Darfur, killing 41 Sudanese army and militia troops. Dozens of army and militia troops were reportedly killed on Saturday by rebel forces in the area of Trogi, south of Kadugli, the capital of South Kordofan., 314 government forces were killed, including a colonel and a captain. 7 January - The Sudan Revolutionary Front (SRF) announced the killing of nine Sudanese military police troops this morning in an attack on a military convoy near Nierteti in Central Darfur. 8 January - The Sudan Revolutionary Front (SRF) announced that the combined forces of the Sudan People's Liberation Movement-North (SPLM-N) and the Sudan Liberation Movement, led by Abdel Wahid El Nur, on Wednesday destroyed the military garrison of Dalami, Habila locality, in South Kordofan. On 9 January, clashes have erupted between the Sudanese army and rebels in the southern town of Dallami in South Kordofan State, the military spokesman says. 13 January - The Liberation Movement for Justice (LMJ) presided by Taher Hajar (militarily led by Ali Karbino) announced it attacked this afternoon (Monday) the Sunta military garrison in South Darfur. More than 13 Sudanese Armed Forces (SAF) and militia troops were allegedly killed. 17 January - The Sudan People's Liberation Movement-North (SPLM-N) claimed the killing of 74 Sudanese army and militia troops in a battle in the area of Malkan, Blue Nile state, on Friday. Both the army and the rebels continue to claim they are in control of Malkan. 22 January - The Liberation Movement for Justice (LMJ), led by Ali Karbino, announced that its forces took control of the Kalaimendo garrison in North Darfur, The rebels claim to have killed 20 government troops. On 26 January, Sudanese Air Force have launched air strikes against a key rebel-held town Kauda in South Kordofan, but there were no reports of casualties. 26 January - The Sudan Revolutionary Front (SRF) reported that its troops attacked a military convoy in South Darfur, rebels claimed that nine government and militia troops were killed. On 12 February, in an explosion landmine killed five people and thirteen wounded in the South Kurdufan in north of Sudan. Sudanese media almost never give casualty reports from Kurdufan or Blue Nile, where government troops and rebels of the Sudan People's Liberation Movement - North (SPLM-N) have been fighting since 2011. 26 February - The Sudan Liberation Movement, led by Minni Minawi (SLM-MM) announced that on Wednesday they killed 20 militiamen in a battle with Rapid Support Forces in South Darfur. 2 March - Joint rebel forces killed 83 army and militia troops in attacks on the military garrisons of Alliet Jarelnabi and Haskanita, North Darfur. 5 March - Darfur rebel forces announced full control of three localities in North Darfur, Alliet, El Taweisha, and Kalamindo. The total of government troops killed in the battle of El Taweisha is 48. 13 March - The Darfur rebel forces announced taking control of Mellit in North Darfur, The joint Darfur rebel forces claimed that a total of 97 forces died, but only 78 according to the Government. On 13 March, Sudanese authorities sentenced SPLM-N commanders Malik Agar and Yassir Arman as well as 15 fighters to death. 16 March - In the area of Kulkul, north of El Fasher, the capital of North Darfur, 83 Sudanese army and militia troops were killed, and dozens of others injured during an attack by the "Darfur joint resistance forces". 17 March - The "Darfur joint resistance forces" claim to have killed 44 government and militia troops in East Jebel Marra. On 16 April 2014, Sudanese armed forces official al-Sawarmi Khalid stated that in the aftermath of the second phase of the Operation Decisive Summer the eastern areas of South Kordofan have been completely clear out of militants. 28 April - The Sudan Liberation Movement, under the leadership of Abdel Wahid El Nur (SLM-AW), announced that they attacked the military garrison of Rokoro in Central Darfur, 27 Sudanese army and militia troops were killed. 1 May - The Sudan People's Liberation Movement-North (SPLM-N) announced that they killed 22 Sudanese army and militia troops in South Kordofan. 1 May - The Sudan Liberation Movement, led by Abdel Wahid El Nur (SLM-AW) has announced that it destroyed the military base of Turo, near Golo, west of Jebel Marra, 15 army and militia troops were killed, and others injured. 16 May - The forces of the Sudan People's Liberation Movement-North (SPLM-N) claimed on Thursday to have destroyed two Sudanese military convoys which tried to occupy areas in Abu Jubeiha and Talodi localities in South Kordofan state. They have killed at least 65 soldiers, the SPLM-N spokesman stated, and have lost 11 troops. 19 May - The Justice and Equality Movement faction led by Bakhit Dabjo (JEM-Sudan) announced the killing of 30 army and militia troops in the area of Galab in North Darfur. On 6 June, Sudanese army spokesman al-Sawarmi Khaled Saad said that the troops captured a rebel position in South Kordofan. At noon today our armed forces liberated Al-Atmur region, which is a military base where the (SPLM-N) rebels stocked heavy weapons, including cannons and multiple rocket launchers. 6 June - The spokesman for the Sudan Armed Forces (SAF), Colonel El Sawarmi Khalid Saad, announced that the army and the paramilitary Rapid Support Forces (RSF) liberated an area near Kadugli, the capital of South Kordofan. 9 June - The Sudanese People's Liberation Army – North (SPLA-N) and government forces claim to have inflicted 'heavy casualties' on each other's forces in South Kordofan and Nuba Mountains. According to rebels, they lost 3 men. On 17 June 2014, U.S. ambassador in the United Nations Samantha Power condemned Sudan's use of barrel bombs and accused Sudan of purposely bombing hospitals and civilian facilities in the South Kordofan and Blue Nile states. On 29 June, Sudanese troops and rebels engaged in heavy fighting near the city of Kadugli the state capital of South Kordofan. 29 June - The Sudan People's Liberation Movement-North (SPLM-N) announced that it killed 15 army and militia troops, and wounded others in El Atmor, South Kordofan. 24 November 2014, SPLM rebels claimed to have launched two attacks on government positions in the Blue Nile region. The claims were disputed by Sudanese officials, who stated that the Sudanese army clashed with rebels in the towns of Yabous and Shali. On 1 December 2014, SPLM militants clashed with government forces in the Alahimr area of South Kordofan, both sides accused each other of starting the offensive in the area. On 3 December 2014, the Sudanese army claimed to have killed 50 rebels during clashes in the villages of Balanja and al-Atmour in South Kordofan. On 8 December 2014, clashes between militants and government forces clashed in South Kordofan. On 12 December 2014, SPLA-N insurgents captured the al-Daldako and Ruseiris and Jabal Nimir areas of South Kordofan. Guerrillas seized three cannons, a tank and three military vehicles, inflicting heavy casualties to the Sudanese troops. The Sudanese government responded by resuming the Operation Decisive Summer in the above-mentioned areas as well as Darfur. On 24 December 2014, SPLA-N guerrillas killed 25 SAF troops during fighting in the vicinity of Dalouka also seizing weaponry in an abandoned military camp located in Tourlake. On 27 December 2014, a SPLA-N press release stated that a Sudanese air force Antonov aircraft had crashed in the Al-Shai'r area of South Kordofan, rebels claimed that six SAF soldiers perished in the incident. On 1 January 2015, a video interview with SPLM-N commander Koko Idriss was released, Idriss claimed that during the past 3 weeks SPLM-N clashed with government troops in Balinga, Daldako, al-Atmoor and al-Ruseiris, Gardoud with the later falling under Sudanese control. The video displayed 44 Dushka cannons,13 Land Cruiser vehicles, 2 oil tankers, and a T 55 tank allegedly captured by the rebels. Idriss further stated that 3 SPLM-N fighters were killed and 15 wounded during the clashes also accusing Sudan of employing child soldiers. The video also contained accusations of heavy Sudanese aerial bombings on residential areas of the region. On 2 January 2015, SPLM-N pledged to destroy its stockpiles of anti-personnel landmines. Rebels also announced that 20 government soldiers will be released from captivity in response to talks with the Sa'ihoon group. On 11 January 2015, SPLM-N repulsed simultaneous SAF attacks on Dalouka, al-Qnezih, Medem Khor Damar and Teludi. A total of 13 government soldiers were killed in action while SPLM-N suffered 2 dead and 2 injured. On 15 January 2015, SPLM-N claimed to have inflicted over 100 casualties to the Sudanese army, while at the same time capturing the Blinga camp along with various military equipment. SPLM-N estimated its own casualties at 1 killed and 14 wounded. At the same time a Sudanese spokesman issued a conflicting report declaring that SAF repulsed rebel attack on the al-Qneziah, Dalouka and Blinga areas, dealing heavy losses to the attackers. On 16 January 2015, SPLM-N recaptured the towns of Ankarto and Um Turq-Turq. On the same day Sudan's humanitarian commission released a statement claiming that a total of 145,000 people have been internally displaced due to the conflict. On 21 January 2015, SPLM-N announced the capture of the Talodi-Alnuba village following the fall of a government outpost in the area. According to a rebel spokesman military equipment was seized as Sudanese troops retreated to Talodi. On 23 January 2015, SAF bombed a Doctors Without Borders hospital in the rebel held village of Frandala, one patient and one DFB volunteer were wounded, the hospital also sustained major material damage. The UN Office for the Coordination of Humanitarian Affairs condemned the attack. On 26 January 2015, SPLM-N guerillas shot down a United Nations helicopter in an area east of Kadugli. The helicopter crew consisting solely of Bulgarian pilots managed to land the damaged vehicle, no casualties were reported. According to the UK based Sudan Social Development Organization, four people were wounded following indiscriminate shelling conducted by the Sudanese military, the incident occurred in the towns of Um Sirdiba and Alatmour. On 1 February 2015, SPLM-N released 6 Bulgarian pilots previously captured on 26 January 2015. On 8 February 2015, three Sudanese Red Crescent Society aid workers were killed in Kurmuk, Blue Nile state, after unknown assailants targeted their vehicle. On 10 February 2015, a rebel ambush that took place outside Kurmuk, lead to the death of 4 government troops. On the same day Sudanese troops engaged guerrillas in the Angasama hills locale, four soldiers were killed and five were captured, as the rebels seized a number of assault rifles and vehicles. On 24 February 2015, SPLM-N insurgents overrun the Kahliat garrison, located 5 kilometers west of Kadugli, 10 soldiers were killed and 2 rebels were injured in the aftermath of the skirmish. On 22 March 2015, a rebel raid on the Bau garrison in Blue Nile led to the deaths of 8 soldiers and the injury of 4 insurgents, the attackers seized large amounts of weaponry and ammunition. On 28 March 2015, SPLM-N announced the capture of the strategically located Habeela town, 54 soldiers were allegedly killed and five military vehicles captured. A government spokesman claimed that the town remained outside rebel control, further accusing the rebels of torching and destroying civilian houses and market facilities. On 11 April 2015, rebels carried out an ambush on SAF soldiers in the areas of Al-Dabkar and Al Abbasiya-Taqali, killing 13 SAF personnel. On June 18, 2016, the Sudanese President, Omar al-Bashir, declared a 4-month long ceasefire. Army spokesman Ahmed Khalifa al-Shami stated that the ceasefire was intended "to give the armed groups a chance to join the peace process and to surrender their arms. On February 21, 2017, Sudan attacked SPLM-N positions in the area of the town of Kadugli, violating the ceasefire. On 11 April 2019, amid weeks of demonstrations and ongoing protests in the capital of Khartoum, Sudanese president Omar al-Bashir was removed from power in a coup d'état by the Sudanese Armed Forces after nearly 30 years in office. Vice president and defense minister Ahmed Awad Ibn Auf dissolved the government of al-Bashir and formed a military council to run the country. Two weeks after the ouster of Sudan’s Omar Al Bashir, Uganda's foreign minister Okello Oryem, has announced that his country may offer Bashir refuge. Sometime during March an undated video emerged of the Governor of South Kordofan Ahmed Haroun telling Sudanese soldiers: "You must hand over the place clean. Rub it, crush it and sweep it. Don't bring them [Rebels] back alive. We have no space for them". An army commander standing near Haroun then says: "Don't bring them back, eat them alive" amid laughter by the group in the video. Haroun follows with "Don't create an administrative burden for us [by bringing back prisoners alive]". The United Nations High Commissioner for Human Rights Navi Pillay warned that the comments by the Governor could amount to "violations of human rights and international humanitarian law in South Kordofan and Blue Nile states". She followed with "Such comments are extremely worrying in this context and could amount to incitement.". The Sudanese Government has since claimed that Mr. Haroun, who has already been indicted for war crimes and crimes against humanity by the International Criminal Court (ICC) for his alleged role in the previous conflict in Darfur, was simply trying to boost the soldiers' morale. Mr Haron however, has called the video a fabrication, accusing al-Jazeera of editing the video to distort what he had said and vowed to sue the news channel. Ms. Pillay said that witnesses who have visited the Nuba mountain region, mainly inhabited by the Nuba people and located in Southern Kordofan, have been reporting the burning of villages and killing of civilians in "an apparent scorched-earth policy." "We know very little about the scale of the military operation in Southern Kordofan, as we have been denied access to the area," she said. "But as far back as August last year, we found that human rights violations that could amount to crimes against humanity or war crimes have taken place in Southern Kordofan.". Following what Yasir Arman, leader of SPLA-N and the UN have described as a "scorched earth policy" more than 105,000 Sudanese refugees from the states of Southern Kordofan and Blue Nile have sought refuge in South Sudan. An additional 30,000 refugees fled Blue Nile into nearby Ethiopia. The Office of the United Nations High Commissioner for Refugees (UNHCR) and its partners started providing basic assistance to more than 16,000 refugees who settled in Yida, South Sudan, after fleeing violence in the Nuba Mountains region, located in Sudan's Southern Kordofan state. Another 2,300 refugees have so far moved southwards to safer sites in Nyeel and Pariang to another UNHCR camps. Meanwhile, in South Sudan's Upper Nile state, where an influx of refugees from Sudan's Blue Nile state is continuing, relocation from border zones has been ongoing. About 86,000 Sudanese refugees fleeing attacks in Blue Nile state have relocated to the safety of formal sites in Doro and Jammam, Ms. Fleming said. However, since the beginning of Sudanese border conflict in 2012 the UNHCR now considers the Yida refugee settlement as not safe for long-term stay due to its proximity to the volatile border zone. South Sudan authorities at central and local level are also urging refugee leaders to relocate, in line with the provisions of the 1969 OAU (now AU) Convention on Refugees. Article 2 stipulates that "for reasons of security, countries of asylum shall, as far as possible, settle refugees at a reasonable distance from the frontier of their country of origin". On 23 August 2011, President Omar al-Bashir announced a two-week unilateral ceasefire in the conflict while on a surprise visit to South Kordofan state. He said the government would continue to embargo foreign aid directed toward South Kordofan, and the only humanitarian access would be through the Sudanese Red Crescent. He said that after the two-week ceasefire, "the situation will be assessed on the ground". African Union – On 29 June, AU Commission Chairperson Jean Ping called on both sides in South Kordofan "to immediately cease hostilities, to allow the access of humanitarian aid and the return of displaced people" and hailed a ceasefire agreement as "decisive" and "a good omen". The AU, led first by former South African President Thabo Mbeki and then by Ethiopian Prime Minister Meles Zenawi, attempted to mediate a solution to growing tensions in Blue Nile, but it failed to prevent the spread of the conflict. United Nations – The United Nations Security Council voted on 3 June to demand that Sudan and Southern Sudan withdraw troops from the Abyei Area. Secretary-General Ban Ki-moon voiced support for efforts to end the conflict in late June 2011, saying on 29 June that Sudan and the SPLM-N must work quickly for a cessation of hostilities. A United Nations Mission in the Sudan human rights investigation in June and early July, prior to the mission's disbandment, found that "condemnation is insufficient" for the atrocities it said had been committed by the Sudanese military during the fighting, including attacks on UNMIS offices and personnel, though it also criticised the SPLM for violations. In August, the United States attempted to persuade the Security Council to pass a resolution condemning the violence, but it was blocked by Sudanese allies Russia and China. United Nations High Commissioner for Refugees António Guterres responded to the outbreak of violence in Blue Nile in September by saying both sides must work to prevent "yet one more refugee crisis" in the region. Ban also expressed concern over the violence. South Sudan – On 22 May, South Sudan denounced the seizure of Abyei as an "act of war". Information Minister Barnaba Marial Benjamin denied claims by the Sudanese government that Juba was offering material support to SPLM-N fighters in the North on 31 August and asserted that the SPLM had severed all ties with the SPLM-N after independence. He expressed concern at the violence in Blue Nile on 2 September and called on the Sudanese government to launch a full investigation and endeavour to prevent the violence from spreading. United States – Having condemned the military takeover of Abyei on 21 March, on 22 July, Ambassador to the United Nations Susan Rice accused the Sudanese military of perpetrating human rights violations in South Kordofan. Princeton Lyman, the US special envoy to Sudan, said on 10 August that Washington was concerned that fighting could spread to and involve newly independent South Sudan. France – On 22 May 2011, France condemned the military takeover and demanded a Sudanese withdrawal from Abyei. France argued that Sudan's actions constituted a violation of 2005 peace agreement and of the Kadugli Accord signed in January, and that the conflict should be mediated by the African Union. Canada – On 23 May 2011, the Canada's Foreign Affairs Minister, John Baird, condemned the "recent upsurge of violence in Abyei". Canada called for an immediate withdrawal by both sides, respect for human rights and avoidance of further escalation. Baird added that he hoped "Northern and Southern Sudan" would both "embrace the opportunity afforded by the African Union High-Level Implementation Panel to resolve the status of Abyei and other outstanding issues". Groups such as Human Rights Watch and Amnesty International have expressed concern about the humanitarian situation. In May 2012, researchers from the Humanitarian Policy Group at the Overseas Development Institute highlighted that the situation in South Kordofan was approaching crisis levels and called for stronger leadership and engagement from humanitarian actors, as well as a redoubling of diplomatic efforts to restart political dialogue in the hope of securing a lasting and peaceful resolution. ^ "Ethiopia Is Arming South Kordofan Rebels says Ethiopian officer". 13 April 2012. ^ a b "PressTV-Rebels, Sudan army clash in Dalami". Presstv.ir. Archived from the original on January 18, 2015. Retrieved 26 January 2015. ^ Uma, Julius (2011-09-05). "UN report: 1,500 killed and 73,000 displaced in S. Sudan conflicts". Sudan Tribune. Juba. Archived from the original on November 29, 2011. ^ a b c "Sudanese army retake SRF rebel area in South Kordofan". Sudan Tribune. 20 November 2013. Retrieved 13 December 2014. ^ "Series of explosions at weapons cache rock town in West Kordofan". Sudan Tribune. 6 June 2016. ^ "Sudan, two rebel factions discuss ways to hold peace talks on Darfur conflict". Sudan Tribune. 5 June 2016. ^ "Sudan Military Strength". GFP. Retrieved 27 March 2014. ^ a b "Radio Dabanga - Independent news and relevant information from the heart of Darfur". Archived from the original on October 15, 2014. Retrieved 11 November 2014. ^ "500 refugees fleeing South Kordofan per week: UNHCR". Sudan Tribune. 5 February 2015. Retrieved 2 March 2015. ^ "Independence of South Sudan, and continued fighting in many parts (2011)". UCDP Conflict Encyclopedia. Retrieved 18 January 2015. ^ a b "Sudan rebels form alliance to oust president". Al Jazeera English. 13 November 2011. Retrieved 13 November 2011. ^ "South Kordofan & Blue Nile: Population Movements Fact Sheet" (PDF). OCHA. 19 May 2014. Retrieved 18 January 2015. ^ "Sudan: Humanitarian Snapshot" (PDF). OCHA. 31 October 2014. Retrieved 18 January 2015. ^ "Sudanese troops close in on last rebel stronghold in South Kordofan". The Guardian. 14 January 2015. Retrieved 18 January 2015. ^ "Sudan troops battle rebels in war-torn South Kordofan". AFP. 13 January 2015. Retrieved 18 January 2015. ^ a b "Sudan's South Kordofan: 'Huge suffering from bombs'". BBC News. 14 June 2011. Retrieved 24 June 2011. ^ Jal, Emmanuel (8 August 2011). "We must act to stop South Kordofan becoming the next Darfur – Emmanuel Jal". The Guardian. London. ^ "Early Warning of Attacks on Civilians". Satsentinel.org. Retrieved 26 January 2015. ^ "Khartoum's Military Seizure of Abyei: Findings of the Satellite Sentinel Project". Southsudannewsagency.com. Retrieved 26 January 2015. ^ "Sudan army claims SPLA launched deadly attack in Abyei". Sudan Tribune. 19 May 2011. Archived from the original on August 30, 2011. Retrieved 3 September 2011. ^ "Sudan: UN mission concerned over fighting in Abyei, urges civilian protection". UN News Centre. 21 May 2011. Retrieved 3 September 2011. ^ "North Sudan seizes disputed Abyei, thousands flee". Reuters. 22 May 2011. Retrieved 25 May 2011. ^ a b c "Sudan's Bashir threatens a repeat of Abyei and S. Kordofan "lessons"". Sudan Tribune. 20 June 2011. Archived from the original on June 23, 2011. Retrieved 24 June 2011. ^ "TEXT: North and South Sudan agree to demilitarize Abyei". Sudan Tribune. 20 June 2011. Archived from the original on June 29, 2011. Retrieved 24 June 2011. ^ "World welcomes North-South accord on Abyei". Sudan Tribune. 21 June 2011. Archived from the original on June 29, 2011. Retrieved 24 June 2011. ^ "South Sudan denies conceding disputed Abyei to North Sudan". Sudan Tribune. 23 June 2011. Archived from the original on June 29, 2011. Retrieved 24 June 2011. ^ "Sudan's NCP says no negotiations with arms-holders in South Kordofan". Sudan Tribune. 15 June 2011. Archived from the original on June 29, 2011. Retrieved 24 June 2011. ^ a b "Sudan: Barack Obama calls for ceasefire". BBC News. 15 June 2011. Retrieved 24 June 2011. ^ "JEM takes responsibility for attack on army camp in S. Kordofan". Archived from the original on July 4, 2011. Retrieved 11 November 2014. ^ "JEM Field commander: JEM soldiers defeated army battalion". Archived from the original on December 15, 2013. Retrieved 11 November 2014. ^ "Armed clashes in Fula, South Kordofan". Archived from the original on December 15, 2013. Retrieved 11 November 2014. ^ "UN call for S Kordofan war crimes probe". Al Jazeera English. 19 July 2011. Retrieved 23 July 2011. ^ "Sudanese Clergy, Rights Groups Want Peacekeepers in South Kordofan - News - Talk Radio News Service: News, Politics, Media". Talk Radio News Service. Archived from the original on 2012-09-13. Retrieved 11 November 2014. ^ "Joint JEM/SPLA Forces defeat SAF in South Kordofan". Archived from the original on November 14, 2011. Retrieved 11 November 2014. ^ "Sudan court sentences rebel leader to death: agency". Reuters. 27 August 2011. Retrieved 3 September 2011. ^ "SPLM-N to hold summit with Darfur rebel groups". Sudan Tribune. 27 August 2011. Archived from the original on August 29, 2011. Retrieved 9 September 2011. ^ "South Kordofan rebels say food used as a weapon by Khartoum". Arab News. 1 September 2011. Archived from the original on September 4, 2011. Retrieved 11 September 2011. ^ "Sudan rebels kill 17 civilians: state media". Star Africa. 3 September 2011. Archived from the original on 2012-03-21. Retrieved 11 September 2011. ^ "Fresh fighting in Jebel Marra". Archived from the original on December 15, 2013. Retrieved 11 November 2014. ^ "Blue Nile: Sudan declares state of emergency". BBC News. 2 September 2011. Retrieved 3 September 2011. ^ Boswell, Alan (2 September 2011). "Sudan's Conflict Spreads: Is This the Start of a New Civil War?". Time. TIME Magazine. Retrieved 3 September 2011. ^ "Sudan declares emergency in Blue Nile state". Al Jazeera English. 3 September 2011. Retrieved 3 September 2011. ^ "SPLM-North claims victory on several battlefields". Archived from the original on December 15, 2013. Retrieved 11 November 2014. ^ "Rebels call for non-fly zone in Blue Nile, Darfur and S. Kordofan". Sudan Tribune. 4 September 2011. Archived from the original on September 29, 2011. Retrieved 9 September 2011. ^ "Sudan army speak about new victories in Blue Nile". Sudan Tribune. 10 September 2011. Archived from the original on September 29, 2011. Retrieved 11 September 2011. ^ "SPLA clashes with Sudanese army in S Kordofan". Archived from the original on December 15, 2013. Retrieved 11 November 2014. ^ "SPLM-N claims gunning down 30 Sudanese soldiers". Archived from the original on December 15, 2013. Retrieved 11 November 2014. ^ Klein, Alice (9 November 2011). "Sudan warns it is ready to return to war with South Sudan". The Daily Telegraph. London. The Telegraph. Retrieved 13 November 2011. ^ "Bashir declares "liberation" of Kurmuk, threatens South Sudan". 8 November 2011. Archived from the original on November 9, 2011. Retrieved 13 November 2011. ^ "Sudan 'bombs refugees' in South Sudan's Unity state". BBC. 10 November 2011. Retrieved 10 November 2011. ^ "SLA-AW clashes with Sudanese army". Archived from the original on December 15, 2013. Retrieved 11 November 2014. ^ "SAF: 'SPLA forces in Lake Alubaid defeated'". Archived from the original on November 11, 2014. Retrieved 11 November 2014. ^ "SAF, SPLM-N claim victory in South Kordofan battle". Archived from the original on December 15, 2013. Retrieved 11 November 2014. ^ a b "New clashes in South Kordofan leave 19 dead, rebels say". Sudan Tribune. 12 December 2011. Archived from the original on December 29, 2011. Retrieved 25 December 2011. ^ "Khartoum University raided". Radio Dabanga. 22 December 2013. ^ "Khartoum University raided". Radio Dabanga. 22 December 2011. Archived from the original on June 11, 2012. Retrieved 25 December 2011. ^ El Wardany, Salma (25 December 2011). "Sudan Police Fire Tear Gas, Arrest 73 Students in Khartoum". Bloomberg Businessweek. Archived from the original on 22 July 2012. Retrieved 25 December 2011. ^ "Sudan army kills Darfur rebel leader". Al Jazeera English. 25 December 2011. Retrieved 25 December 2011. ^ "'Alarming malnutrition' in Sudanese conflict zones: UN official". The National Post. January 4, 2012. Retrieved 7 January 2012. ^ "Fighting breaks out in Blue Nile state". Radiotamazuj.org. Retrieved 11 November 2014. ^ "Clashes kill three JEM soldiers in East Darfur". Archived from the original on December 15, 2013. Retrieved 11 November 2014. ^ "SLM-MM 'kills 12 government soldiers' south of El Fasher". Archived from the original on December 15, 2013. Retrieved 11 November 2014. ^ "Sudan rebels say behind attack on Sudanese army". Reuters. 28 February 2012. ^ "South Sudan Accuses North of Bombing Oil Wells". Blog.voanews.com. Retrieved 11 November 2014. ^ "JEM clashes with government troops in North Darfur". Archived from the original on November 11, 2014. Retrieved 11 November 2014. ^ "Sudan and South Sudan in fierce oil border clashes". BBC News. 27 March 2012. ^ "Fighting rages near key Sudan border village". modernghana.com. Retrieved 11 November 2014. ^ "SRF claims control of Heglig, SLM-AW fight army in Darfur". Archived from the original on December 15, 2013. Retrieved 11 November 2014. ^ "Sudan rebels 'kill' 79 troops, militia in Blue Nile". Mysinchew.com. Retrieved 11 November 2014. ^ "South Sudan-Sudan clashes spreading, officials say". Archived from the original on November 11, 2014. Retrieved 11 November 2014. ^ "SRF withdraws from Gereida". Archived from the original on December 20, 2013. Retrieved 11 November 2014. ^ "Fighting breaks out between 'Oppressed Soldiers' and SAF in West Darfur". Archived from the original on January 3, 2014. Retrieved 11 November 2014. ^ "Rebels kill Sudan official, 7 others in border state". English.alarabiya.net. Retrieved 11 November 2014. ^ "Rebels Kill Sudan Official, 7 Others at S. Sudan Border". En.rian.ru. Retrieved 11 November 2014. ^ "Sudán: Ejército mata a medio centenar de rebeldes". Diario Correo Perú. Archived from the original on January 3, 2014. Retrieved 11 November 2014. ^ "SRF clashes with government forces in South and North Kordofan". Archived from the original on January 3, 2014. Retrieved 11 November 2014. ^ "SPLA claims win over Sudan in South Kordofan". Radiotamazuj.org. Retrieved 11 November 2014. ^ "SRF destroys government forces' camp in El-Meiram". Archived from the original on December 15, 2013. Retrieved 11 November 2014. ^ "Front claims government defeat in North Darfur locality". Archived from the original on December 15, 2013. Retrieved 11 November 2014. ^ "Revolutionary Front kills seven soldiers in East Darfur". Archived from the original on December 15, 2013. Retrieved 11 November 2014. ^ "SRF attacks government convoy in Darfur killing scores of people". Archived from the original on December 15, 2013. Retrieved 11 November 2014. ^ "SPLM-N accuses government forces of killing dozens in S Kordofan". Archived from the original on December 15, 2013. Retrieved 11 November 2014. ^ "Army vehicle ambushed in south-west Kordofan". Radiotamazuj.org. Retrieved 11 November 2014. ^ "Clashes between SPLA-North and SAF in South Kordofan". Archived from the original on December 15, 2013. Retrieved 11 November 2014. ^ "SAF: 17 SPLA-N soldiers killed in El-Moreib clashes". Archived from the original on October 25, 2012. Retrieved 11 November 2014. ^ Lety Du. "Ejército sudanés: Mueren 77 rebeldes en Kordofán del Sur, Darfur". Spanish.china.org.cn. Retrieved 11 November 2014. ^ "Continued clashes between SRF and Sudanese army". Archived from the original on November 11, 2014. Retrieved 11 November 2014. ^ "Battles between SAF and rebels leave 81 dead". Archived from the original on December 15, 2013. Retrieved 11 November 2014. ^ "Dozens killed in clashes between government and rebels". Archived from the original on December 15, 2013. Retrieved 11 November 2014. ^ "Darfur rebels kill dozens government troops". Archived from the original on October 31, 2012. Retrieved 11 November 2014. ^ "S. Darfur deputy: 70 SRF soldiers dead". Archived from the original on October 2, 2012. Retrieved 11 November 2014. ^ "SRF kills 22 Sudanese government troops". Archived from the original on November 15, 2012. Retrieved 11 November 2014. ^ "SRF kills 21 government troops". Archived from the original on December 15, 2013. Retrieved 11 November 2014. ^ "SRF 'liberates' Surkum". Archived from the original on October 23, 2012. Retrieved 11 November 2014. ^ "Government and JEM clash in South Kordofan". Archived from the original on December 15, 2013. Retrieved 11 November 2014. ^ "Militiamen killed in battle with SRF". Archived from the original on December 15, 2013. Retrieved 11 November 2014. ^ "SPLA-N kills 6 Sudanese troops". Archived from the original on January 3, 2014. Retrieved 11 November 2014. ^ "SPLM-N: '30 Sudanese government troops killed'". Archived from the original on January 3, 2014. Retrieved 11 November 2014. ^ "SPLM-N claims killing 70 Sudanese troops". Archived from the original on November 4, 2012. Retrieved 11 November 2014. ^ "SPLM-N: Antonov down, rebels and army clash". Archived from the original on December 15, 2013. Retrieved 11 November 2014. ^ "SRF: More than 100 killed and injured in recent clashes". Archived from the original on January 16, 2013. Retrieved 11 November 2014. ^ "Rebels: 23 SAF killed near Kadugli airport". Archived from the original on November 11, 2014. Retrieved 11 November 2014. ^ "SLM-AW claims killing 83 Sudanese soldiers". Archived from the original on November 11, 2014. Retrieved 11 November 2014. ^ "SPLA-N Ambush SAF, 6 SAF Soldiers Dead | Nuba Reports". Archive.is. Archived from the original on 2013-06-24. Retrieved 2017-07-21. ^ "Army claims victory over rebels, 2 LJM field commanders killed". Archived from the original on December 15, 2013. Retrieved 11 November 2014. ^ a b SPLA-N weapons and equipment, South Kordofan, December 2012 (PDF). HSBA Arms and Ammunition Tracing Desk. Small Arms Survey. February 2013. pp. 1–11. ^ "SPLM-N: 27 army officers and 3 rebels dead". Archived from the original on December 15, 2013. Retrieved 11 November 2014. ^ "Radio Dabanga - Independent news and relevant information from the heart of Darfur". Archived from the original on May 29, 2012. Retrieved 11 November 2014. ^ "Dispute between Sudanese soldiers leaves 8 dead, sources". Archived from the original on December 15, 2013. Retrieved 11 November 2014. ^ "SRF: SAF air strike 'wrongly' kills 27 Sudanese soldiers". Archived from the original on December 15, 2013. Retrieved 11 November 2014. ^ "SLM-AW claims killing 18 soldiers". Archived from the original on December 15, 2013. Retrieved 11 November 2014. ^ "SLM-AW: more than 20 Sudanese soldiers killed". Archived from the original on December 15, 2013. Retrieved 11 November 2014. ^ "Darfur battle in Golo leaves tens of soldiers killed". Archived from the original on November 11, 2014. Retrieved 11 November 2014. ^ "SRF Abdel Wahid overruns two SAF garrisons in Darfur". Archived from the original on June 5, 2013. Retrieved 11 November 2014. ^ "Heavy fighting in C. Darfur kills 70 soldiers, 5 rebels: SRF". Archived from the original on December 15, 2013. Retrieved 11 November 2014. ^ "Army in control of C. Darfur's Jildu, 30 rebels killed: SAF". Archived from the original on December 15, 2013. Retrieved 11 November 2014. ^ "Sudan army kills 50 rebels in S. Kordofan clashes, SPLM-N denies". Archived from the original on December 15, 2013. Retrieved 11 November 2014. ^ "SLJM group claims killing 25 soldiers in S. Darfur combat". Archived from the original on January 15, 2013. Retrieved 11 November 2014. ^ "SPLA-N Attacked in Al Sonut, SAF and SPLA-N See Casualties | Nuba Reports". Archive.is. Archived from the original on 2013-06-24. Retrieved 2017-07-21. ^ "SLM-AW: 52 Sudan army and 5 rebels killed in C. Darfur battle". Archived from the original on November 11, 2014. Retrieved 11 November 2014. ^ "Rebels claim seizing military base in C. Darfur, 'over 100 killed'". Archived from the original on November 11, 2014. Retrieved 11 November 2014. ^ "Joint rebel offensive: '87 SAF' killed in S. Darfur battle". Archived from the original on December 15, 2013. Retrieved 11 November 2014. ^ "Government forces clash with SPLM-N in S. Kordofan". Archived from the original on December 15, 2013. Retrieved 11 November 2014. ^ "Battle in Kurmuk 'ongoing', SAF continues air strikes". Archived from the original on November 11, 2014. Retrieved 11 November 2014. ^ "Rebels claim killing 17 Sudanese soldiers, N. Darfur". Archived from the original on December 15, 2013. Retrieved 11 November 2014. ^ "JEM denies Sudan army's claims of battle in N. Kordofan". Archived from the original on December 15, 2013. Retrieved 11 November 2014. ^ "25 Sudan soldiers killed in joint N. Darfur rebel offensive -sources". Archived from the original on November 11, 2014. Retrieved 11 November 2014. ^ "Rebel groups say 7 'Abu Tira' killed in N. Darfur battle". Archived from the original on November 11, 2014. Retrieved 11 November 2014. 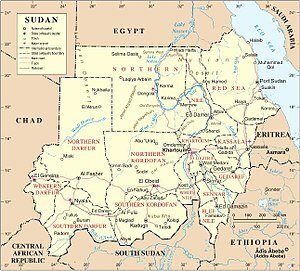 ^ "Conflicting SAF, rebels reports on Sudan's Blue Nile clashes". Archived from the original on December 15, 2013. Retrieved 11 November 2014. ^ "'260 Sudan soldiers, militias killed' in fresh S Darfur clashes –rebels". Archived from the original on December 15, 2013. Retrieved 11 November 2014. ^ "'100 rebels killed and injured in recent S Darfur clashes' -Sudan army". Archived from the original on November 11, 2014. Retrieved 11 November 2014. ^ "Dozens killed in fresh clashes between Sudan army and rebels in South Darfur". sUdantribune.com. Retrieved 11 November 2014. ^ "Sudan Liberation Army seizes Muhajeriya". Radiotamazuj.org. Retrieved 11 November 2014. ^ "Fresh clashes between rebels and Sudan army leave 'dozens killed'". Archived from the original on December 15, 2013. Retrieved 11 November 2014. ^ "Rebels say 18 Sudan officers killed in joint offensive". Archived from the original on May 10, 2013. Retrieved 11 November 2014. ^ "SLA-MM 'in control' of South Darfur military base -rebels". Archived from the original on December 15, 2013. Retrieved 11 November 2014. ^ "Sudan SPLA-N claims control of Dandor garrison near Kadugli". Archived from the original on December 15, 2013. Retrieved 11 November 2014. ^ "Darfur rebels claim to be in control of 2 garrisons near Nyala". Archived from the original on December 15, 2013. Retrieved 11 November 2014. ^ "Nyala airport comes under attack as Darfur rebels claim responsibility". Sudantribune.com. Retrieved 11 November 2014. ^ "Rebels, Sudan army claim victory in South Darfur, thousands fled". Archived from the original on December 15, 2013. Retrieved 11 November 2014. ^ "Sudan: conflicting casualty reports in South Kordofan battle". Archived from the original on December 15, 2013. Retrieved 11 November 2014. ^ "Advance on Abu Karshola repulsed - 411 Sudan soldiers dead: rebels". Archived from the original on October 11, 2014. Retrieved 11 November 2014. ^ "Withdrawal from Abu Karshola, South Kordofan, 'tactical': Sudan rebels". Archived from the original on October 11, 2014. Retrieved 11 November 2014. ^ "'Fierce fighting' in battle for Al Dandor garrison, South Kordofan, Sudan". Archived from the original on December 15, 2013. Retrieved 11 November 2014. ^ "Sudan rebel attack on Abu Karshola 'kills 30 SAF, downs chopper' – Bashir fails to show". Archived from the original on December 15, 2013. Retrieved 11 November 2014. ^ "'Vehicles, ammo captured, 46 SAF troops killed in Darfur': Rebels". Archived from the original on December 15, 2013. Retrieved 11 November 2014. ^ "'SRF kill 14 Sudan government troops in blitz on Abu Karshola, South Kordofan': Rebels". Archived from the original on December 15, 2013. Retrieved 11 November 2014. ^ "'Fierce battle near Thur, Central Darfur, kills 29 government troops': SLA-AW". Archived from the original on December 15, 2013. Retrieved 11 November 2014. ^ "SPLA-N 'attacks Sudan troops inside South Kordofan capital'". Archived from the original on December 15, 2013. Retrieved 11 November 2014. ^ "Sudan's SPLA-N confirms Friday 'shelling of military sites in Kadugli', South Kordofan". Archived from the original on April 5, 2014. Retrieved 11 November 2014. ^ "SPLA 'kills five, injures eight' Sudanese troops in Upper Nile". Radiotamazuj.org. Retrieved 11 November 2014. ^ "SLA-MM rebels 'kill seven Sudan troops' in North Darfur battle". Archived from the original on December 15, 2013. Retrieved 11 November 2014. ^ "'JEM clash with Sudanese government troops' in South Kordofan | Radio Dabanga". Dabangasudan.org. Retrieved 2017-07-21. ^ "Rebels 'capture South Kordofan army base in retaliation for Air Force bombing' | Radio Dabanga". Dabangasudan.org. Retrieved 2017-07-21. ^ "SPLA-N claims 'destruction of two Sudan government patrols' | Radio Dabanga". Dabangasudan.org. Retrieved 2017-07-21. ^ "Rebels 'kill seven Sudanese government troops, capture officers' in South Kordofan | Radio Dabanga". Dabangasudan.org. Retrieved 2017-07-21. ^ "'More than 52 Sudan Armed Forces troops slain in South Kordofan': JEM | Radio Dabanga". Dabangasudan.org. 2013-07-27. Retrieved 2017-07-21. ^ "'15 Sudanese government troops and militiamen killed': rebels | Radio Dabanga". Dabangasudan.org. Retrieved 2017-07-21. ^ "Rebels claim 'destruction of 22 troops and two Sudanese militia camps' | Radio Dabanga". Dabangasudan.org. Retrieved 2017-07-21. ^ "SPLM-N announces one-month unilateral cessation of hostilities over flood situation". Sudan Tribune. 31 August 2013. Retrieved 13 December 2014. ^ "Rebels claim '10 government dead, 30 wounded' in Sudan's Blue Nile state | Radio Dabanga". Dabangasudan.org. 2013-08-25. Retrieved 2017-07-21. ^ "LMJ-Karbino claims control of East Darfur military garrison | Radio Dabanga". Dabangasudan.org. 2013-09-11. Retrieved 2017-07-21. ^ "LJM-Wafi 'kill 10 Sudanese troops' in East Jebel Marra ambush | Radio Dabanga". Dabangasudan.org. Retrieved 2017-07-21. ^ "Rebels, Sudanese army clash in North Darfur | Radio Dabanga". Dabangasudan.org. Retrieved 2017-07-21. ^ "'Three SAF troops captured in Amarjadeed, South Darfur': Rebels | Radio Dabanga". Dabangasudan.org. 2013-10-27. Retrieved 2017-07-21. ^ "Rebels claim attack on 'Abu Tira' HQ in South Darfur | Radio Dabanga". Dabangasudan.org. 2013-10-28. Retrieved 2017-07-21. ^ "Rebels claim attack on SAF and militia in Darfur's East Jebel Marra | Radio Dabanga". Dabangasudan.org. Retrieved 2017-07-21. ^ "SRF 'attacks' on Sudanese army battalions in South Kordofan | Radio Dabanga". Dabangasudan.org. 2013-09-16. Retrieved 2017-07-21. ^ "Sudan's rebels, army clash in Abu Zabad, North Kordofan | Radio Dabanga". Dabangasudan.org. Retrieved 2017-07-21. ^ "SPLM-N claims renewed control of Kalinji village in Sudan's South Kordofan | Radio Dabanga". Dabangasudan.org. Retrieved 2017-07-21. ^ "Rebels claim attack on Sudanese military convoys on North-South Kordofan border | Radio Dabanga". Dabangasudan.org. Retrieved 2017-07-21. ^ "Sudanese rebels capture military camp in South Kordofan: spokesman | Radio Dabanga". Dabangasudan.org. Retrieved 2017-07-21. ^ "Casualties as Sudanese army clashes with rebels in Blue Nile | Radio Dabanga". Dabangasudan.org. Retrieved 2017-07-21. ^ "Sudanese army and rebels clash in Abata, Central Darfur | Radio Dabanga". Dabangasudan.org. Retrieved 2017-07-21. ^ "Sudan rebels shell Kadugli after army attack | Radio Dabanga". Dabangasudan.org. Retrieved 2017-07-21. ^ "Rebels destroy military base in South Darfur | Radio Dabanga". Dabangasudan.org. 2013-10-31. Retrieved 2017-07-21. ^ "Rebels claim control of garrison in South Darfur | Radio Dabanga". Dabangasudan.org. Retrieved 2017-07-21. ^ "SPLA-N kills Sudanese commander in "continuously bombed" Blue Nile | Radio Dabanga". Dabangasudan.org. 2013-12-11. Retrieved 2017-07-21. ^ "Rebels claim attack on North Darfur military garrison | Radio Dabanga". Dabangasudan.org. Retrieved 2017-07-21. ^ "Rebel forces 'attack army battalion in North Darfur': spokesman | Radio Dabanga". Dabangasudan.org. 2013-12-30. Retrieved 2017-07-21. ^ "Rebels claim victory over army convoy in South Kordofan | Radio Dabanga". Dabangasudan.org. Retrieved 2017-07-21. ^ "'Military convoys destroyed in South Kordofan': Revolutionary Front | Radio Dabanga". Dabangasudan.org. Retrieved 2017-07-21. ^ "SLM-AW rebels claim attack on Abu Tira convoy in Central Darfur | Radio Dabanga". Dabangasudan.org. Retrieved 2017-07-21. ^ "Rebel forces destroy garrison, shell another in South Kordofan: SPLM-N spokesman | Radio Dabanga". Dabangasudan.org. Retrieved 2017-07-21. ^ "Rebels 'attack military garrison in South Darfur' | Radio Dabanga". Dabangasudan.org. Retrieved 2017-07-21. ^ "'SPLM-N kills 74 Sudanese troops' in Malkan, Blue Nile | Radio Dabanga". Dabangasudan.org. Retrieved 2017-07-21. ^ "Rebels 'take North Darfur garrison': LMJ spokesman | Radio Dabanga". Dabangasudan.org. Retrieved 2017-07-21. ^ "Sudan warplanes hit rebel-held town: Kordofan insurgents". The Daily Star. 26 January 2014. ^ "SLM-AW claim nine kills in attack on military convoy in South Darfur | Radio Dabanga". Dabangasudan.org. 2013-12-30. Retrieved 2017-07-21. ^ "Landmine kills five in Sudan's Kordofan: state radio". The Daily Star. 12 February 2014. ^ "'SLM-MM destroys recon squad in South Darfur': spokesman | Radio Dabanga". Dabangasudan.org. 2014-02-26. Retrieved 2017-07-21. ^ "Joint rebel forces attack two military garrisons in North Darfur | Radio Dabanga". Dabangasudan.org. 2014-02-26. Retrieved 2017-07-21. ^ "Rebel forces claim control of North Darfur localities | Radio Dabanga". Dabangasudan.org. Retrieved 2017-07-21. ^ "Rebel forces claim control of Mellit, North Darfur | Radio Dabanga". Dabangasudan.org. Retrieved 2017-07-21. ^ "'97 died in capture of North Darfur town': rebels | Radio Dabanga". Dabangasudan.org. Retrieved 2017-07-21. ^ "Sudan rebel leaders, 15 others, condemned to death - lawyer". Reuters. 13 March 2014. Retrieved 11 December 2014. ^ "Rebels attack militia and army troops in East Jebel Marra and North Darfur | Radio Dabanga". Dabangasudan.org. Retrieved 2017-07-21. ^ "Rebels attack Rapid Support Forces in Darfur's East Jebel Marra | Radio Dabanga". Dabangasudan.org. Retrieved 2017-07-21. ^ "Sudanese army clears rebels from eastern S. Kordofan: spokesperson". Sudan Tribune. 16 April 2014. Retrieved 13 December 2014. ^ "SLM-AW rebels claim attack on Rokoro garrison in Central Darfur | Radio Dabanga". Dabangasudan.org. Retrieved 2017-07-21. ^ "Sudan rebels besiege garrison in South Kordofan as Air Force bombs populated areas | Radio Dabanga". Dabangasudan.org. Retrieved 2017-07-21. ^ "SLM-AW attack military base in Darfur's Jebel Marra | Radio Dabanga". Dabangasudan.org. Retrieved 2017-07-21. ^ "SPLM-N claims destruction Sudan army convoys, South Kordofan | Radio Dabanga". Dabangasudan.org. 2014-05-14. Retrieved 2017-07-21. ^ "Rebels claim attack on military convoy in North Darfur | Radio Dabanga". Dabangasudan.org. Retrieved 2017-07-21. ^ "Sudan army says South Kordofan rebel base seized". The Daily Star. 6 June 2014. ^ "Sudan army expels South Kordofan rebels; 'Counter-attack soon' | Radio Dabanga". Dabangasudan.org. Retrieved 2017-07-21. ^ "Sudanese forces, rebels clash at Kadugli | Radio Dabanga". Dabangasudan.org. Retrieved 2017-07-21. ^ "Sudan rebels clash with army in S Kordofan". Al Jazeera. 29 June 2014. ^ "SPLM-N attacks El Atmor in South Kordofan | Radio Dabanga". Dabangasudan.org. Retrieved 2017-07-21. ^ "SPLM-N launches attacks against Sudanese army positions in Blue Nile state". Sudan Tribune. 24 November 2014. Retrieved 13 December 2014. ^ "Sudan army, SPLM-N trade allegations over recent clashes". Sudan Tribune. 2 December 2014. Retrieved 13 December 2014. ^ "Sudan's army reports more clashes with rebels in south as talks on hold". Reuters. 3 December 2014. Retrieved 9 December 2014. ^ a b "Sudan ceasefire talks end without deal as violence increases". Reuters. 9 December 2014. Retrieved 9 December 2014. ^ "SPLA-N rebels capture three areas in South Kordofan – spokesperson". Sudan Tribune. 12 December 2014. Retrieved 13 December 2014. ^ "Sudanese rebels say 25 government soldiers killed in South Kordofan". Sudan Tribune. 24 December 2014. Retrieved 20 January 2015. ^ "SPLM-N rebels say government warplane crashed in S. Kordofan". Sudan Tribune. 27 December 2014. Retrieved 20 January 2015. ^ "SPLM-N says still in control of strategic town in South Kordofan". Sudan Tribune. 2 January 2015. Retrieved 20 January 2015. ^ "SPLM-N pledges to destroy its stockpiles of anti-personnel landmines". Sudan Tribune. 2 January 2015. Retrieved 20 January 2015. ^ "SPLM-N says it repulsed SAF attacks in S. Kordofan, Blue Nile". Sudan Tribune. 11 January 2015. Retrieved 20 January 2015. ^ "Sudan, SPLM-N issue conflicting accounts of S. Kordofan clashes". Sudan Tribune. 15 January 2015. Retrieved 20 January 2015. ^ "SPLM-N recaptures two areas in South Kordofan: spokesperson". Sudan Tribune. 16 January 2015. Retrieved 20 January 2015. ^ "SPLM-N captures new position in South Kordofan: spokesperson". Sudan Tribune. 21 January 2015. Retrieved 28 January 2015. ^ "Sudanese army bombs MSF hospital in S. Kordofan". Sudan Tribune. 23 January 2015. Retrieved 28 January 2015. ^ "SPLM-N rebels shoot down WFP helicopter in South Kordofan". Sudan Tribune. 26 January 2015. Retrieved 28 January 2015. ^ "SPLM-N releases six Bulgarian hostages held in S. Kordofan". Sudan Tribune. 1 February 2015. Retrieved 2 March 2015. ^ "UN condemns killing of aid workers in Blue Nile state". Sudan Tribune. 9 February 2015. Retrieved 2 March 2015. ^ "SPLM-N rebels claim responsibility for killing 4 government soldiers in Blue Nile". Sudan Tribune. 11 February 2015. Retrieved 2 March 2015. ^ "Claims SPLM-N rebels overran SAF garrison near S. Kordofan capital". Sudan Tribune. 24 February 2015. Retrieved 2 March 2015. ^ "Sudan: 'Eight Soldiers Killed in Attack On Blue Nile Garrison' - SPLM-N". All Africa. 22 March 2015. Retrieved 15 April 2015. ^ "SPLM-N fighters claim capture of major town in S. Kordofan". Sudan Tribune. 28 March 2015. Retrieved 15 April 2015. ^ "Claims of fresh clashes between gov't forces, SPLM-N rebels in Sudan's Two Areas". Sudan Tribune. 11 April 2015. Retrieved 15 April 2015. ^ "Bashir declares ceasefire in Blue Nile, South Kordofan - News from". Al Jazeera. 2016-06-18. Retrieved 2017-07-21. ^ a b "Sudan's Bashir orders six-month ceasefire extension in three regi". Alaraby.co.uk. 2014-12-05. Retrieved 2017-07-21. ^ "Sudan's Bashir extends national ceasefire by one month". Alaraby.co.uk. 2014-12-05. Retrieved 2017-07-21. ^ "Sudanese army attacks SPLM-N positions in South Kordofan: rebels say - Sudan Tribune: Plural news and views on Sudan". Sudan Tribune. Retrieved 2017-07-21. ^ CNN, Sarah El Sirgany, Nima Elbagir and Yasir Abdullah. "Sudan's President Bashir forced out in military coup". CNN. Retrieved 2019-04-17. ^ "Sudan rebels suspend hostilities in Blue Nile and South Kordofan". Middle East Eye. Retrieved 2019-04-17. ^ "Sudan SPLM-N rebels suspend hostilities in Blue Nile and South Kordofan". The Defense Post. 2019-04-17. Retrieved 2019-04-17. ^ "UN official criticises videotaped remarks by S. Kordofan governor". Sudan Tribune. Archived from the original on April 8, 2012. Retrieved 14 April 2012. ^ a b "Comments by Sudanese official could lead to further violence - UN rights chief". UN News Service. Retrieved 14 April 2012. ^ "South Kordofan governor vows to sue Al-Jazeera TV over "fabricated" video". Sudan Tribune. Archived from the original on April 7, 2012. Retrieved 14 April 2012. ^ "Comments by Sudanese official could lead to further violence – UN rights chief". UN News Service. Retrieved 14 April 2012. ^ "Sudan 'arming civilians' to fight South Kordofan rebels". BBC News. 14 April 2012. ^ a b "Security Council voices alarm over border clashes between South Sudan and Sudan". UN News Service. Retrieved 14 April 2012. ^ a b "Border insecurity increasing concerns for refugees' safety in Yida, South Sudan". Retrieved 14 April 2012. ^ "Sudan president announces ceasefire in S.Kordofan". Reuters. 23 August 2011. Retrieved 23 August 2011. ^ "African Union hails South Kordofan ceasefire deal". TerraDaily. 29 June 2011. Retrieved 3 September 2011. ^ "Sudan brushes aside UNSC demand for Abyei withdrawal". Sudan Tribune. 4 June 2011. Archived from the original on August 29, 2011. Retrieved 3 September 2011. ^ "Sudan: UN Head Welcomes South Kordofan/Blue Nile Agreement". allAfrica.com. 30 June 2011. Retrieved 3 September 2011. ^ Hsiao, Amanda (14 July 2011). "U.N. Report: 'Condemnation is Insufficient' for South Kordofan Atrocities". Enough Project. Retrieved 3 September 2011. ^ "US fails to get UN to condemn Sudan violence - World News - IBNLive". IBNLive. Retrieved 11 November 2014. ^ "Thousands Flee Unrest in Sudan's Blue Nile State". Voice of America News. 3 September 2011. Retrieved 3 September 2011. ^ "Abyei seizure by north 'act of war', says south". BBC News. 22 May 2011. ^ "South Sudan denies backing South Kordofan rebels". Reuters. 31 August 2011. Retrieved 11 September 2011. ^ "South Sudan calls to contain fighting in Blue Nile". Sudan Tribune. 2 September 2011. Archived from the original on September 29, 2011. Retrieved 3 September 2011. ^ "U.S. condemns Sudan army's takeover of Abyei and dissolution of council". Sudan Tribune. 21 March 2011. Archived from the original on December 29, 2011. ^ "Sudan slams US envoy's remarks on South Kordofan". Sudan Tribune. 28 July 2011. Archived from the original on July 30, 2011. Retrieved 3 September 2011. ^ "US fears Kordofan violence contagion to South Sudan". South Sudan24. 11 August 2011. Retrieved 3 September 2011. ^ "France demands Sudan withdraw from seized town". MuscatDaily.com. 22 May 2011. ^ "Canada Condemns Escalating Violence in Sudan's Abyei Region". Foreign Affairs Media Relations Office, Canada. 23 May 2011. Archived from the original on 22 July 2012. ^ "William Hague condemns violence in Sudan's Abyei region". BBC. 22 May 2011. ^ "Humanitarian crisis in South Kordofan: The need for a political solution | Overseas Development Institute". ODI.org.uk. Retrieved 2017-07-21. ^ Does not represent the number of soldiers stationed in South Kordofan and Blue Nile. Number also includes 85,000 reserve personnel. "Nuba: The Forgotten War". Amnesty International. 21 March 2017.